They have the power to evoke emotions in their hearers and readers. Some words bring lovely thoughts and feelings–words such as wedding, birth, graduation, coming home, promotion. 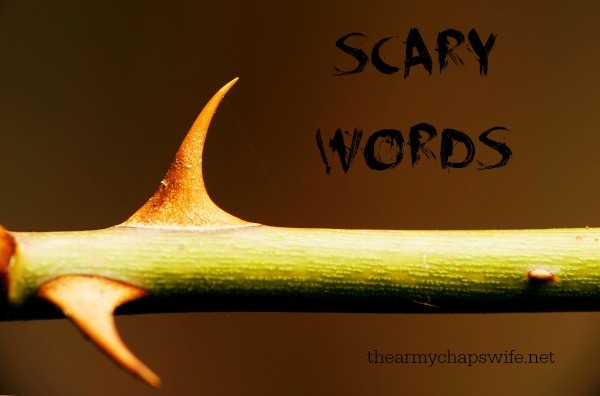 Other words can fill us with fear and foreboding: deployment, separation, illness, test. I’m sure you can come up with other words which have cropped up in your own life and caused any number of emotions to swirl through your heart. I have to face a word today. It’s one of the scary ones–biopsy. And that means facing the scarier word implied by it–cancer. When my nurse-practioner discovered I had anemia, she ordered other tests as well. One of those was a mammogram. I had never had one before, so there was some trepidation over that, and then they actually found something. Not what I was hoping for. Not something anyone ever hopes for! Trust or don’t trust in the goodness and plan of God. Neither one is necessarily easy, but only one brings peace. And I don’t believe trusting means denying the feelings of fear that might come; I believe trusting means being honest about the fear, admitting it to the Lord, and looking to him for help working through it. Trusting means choosing to acknowledge that he knows what is best for us. Our circumstances are never a surprise to him. Even if we might be knocked off kilter by something unforeseen, he never is. Not only that, we are also promised an otherworldly calm directly from him. Now, have I totally come to a point of being at peace about this test? Not completely, but I’m getting there. I am grateful for the family and friends who have told me they are praying. I am grateful for a husband who reminds me not to focus on the what-ifs. I am grateful for a God who knows me and loves me beyond anything I could imagine. Yes, you have definitely had a scary year! It has been encouraging to read your words of trust in the midst of it all. You’re an inspiration to me!